Red Sapphire DJ Entertainment Blog. 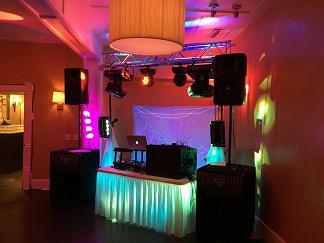 Get the latest information on what Red Sapphire is doing, our new DJ packages, and options. This Winter Ball was a blast. They told me that they sold 300 more tickets this year than they had anticipated which was already projected at 500. Even kids from other schools picked to go to this one instead of their own Winter Ball. I guess some people had major FOMO. We've been doing video screens for many years now, and I just can't get over how cool they look. They can be used for music video display, visualizer programs, PowerPoint presentations, video presentations, logo displays, and other things. We have multiple packages, so people know exactly what they are getting for the price. And, you can always fully customize and create your environment with all kinds of advanced options that we offer. Not all venues are equal so to speak, and that is a great thing because there are so many people with different personalities and tastes. The key to picking a venue is to ask, "Would this venue fit my personality?" These clients are from Boston, so they went with a place that has a more wooden sort of speakeasy type of atmosphere. Being there felt like you were part of this secret underground party being held by people from the roaring 20s. They had the wedding ceremony at a gorgeous location nestled in the mountains, so you also had the elegance there. Places like this bring out personalities, and let people loosen up. I love these venues that have deep histories where some claim that a ghost lives in one of the hotel rooms, that it was a former hideout for mobsters, or that old movies were filmed there. Some places are huge, and can hold tons of people, and those can be just as fun so long as it fits your personality. I did another event this year where the clients were scary movie fans, and they had their wedding at a former psychiatric facility which had been remodeled. These types of venue decisions are one the best ways to make people remember your event because people generally associate things in groups. Sometimes if a venue, a photographer, DJ, or wedding officiant doesn't really fit into your framework of ideas it can seem disjointed. Sometimes I meet with a potential client, and they may say that this other DJ offered to do my event for 10% off whatever you quote me. I then will ask, "Is the owner of the DJ company doing your event?" When they reply, "no," then it throws the framework into limbo. You will constantly be asking, "Who is going to really DJ my event, and what is their personality going to be?" That's why you can never go off the idea that you can match services. Just like you can't match the service provided from one doctor to another; you can't match the service provided from one DJ to another. We all have different styles, abilities, and personalities. The key to all of this is to make sure to match up those personalities with your own, so that you can achieve that "flow-state" for the event. The beauty of my position being the owner who DJs all the events is that people get what they see. I don't have to force my way into doing an event for someone like the multi-op companies do just to fill a spot on the calendar. If a client meets with me and they get a feeling like my prices are too low, too high, our personalities don't align, or for whatever reason, then I don't take it personally at all. The relationships and marriages that I see last are those where it's not forced; these two people come together in a natural way. This is the same way you should look at how to pick a venue, and any other vendor for that matter. I've done many events all over the state of New Mexico, and I finally located my favorite outdoor event area in the state. It reminds me of the old Elks Lodge camping ground that my parents would take us to when we were kids. This place was filled with great people, smiles, amazing carne adovada, and a bride and groom that God made for one another. 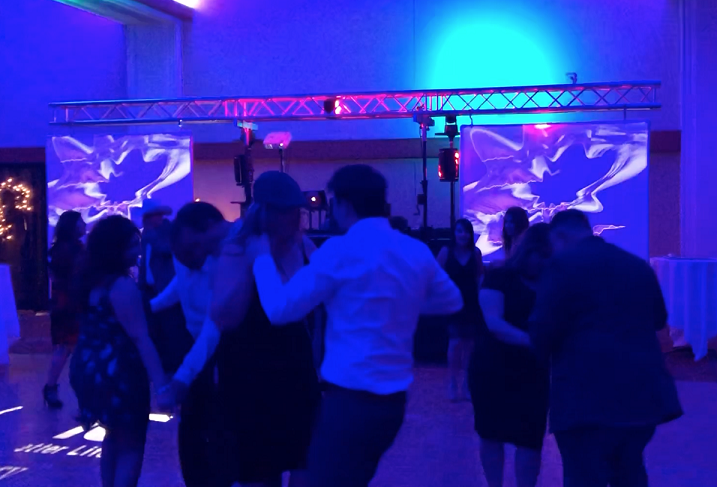 Amazing two-steppin' at this wedding! The Toast is often my favorite part of the evening. It's a true honor to be asked to perform a toast to the bride and groom. It shows that the couple trusts the toaster enough to talk about their experiences with them in a tasteful way. Some toasts are funny, witty, tearful, tipsy (LOL), and enlightening. But, are always much appreciated. Make sure your DJ has a good microphone for toasting, or it will be only distracting. Just an amazing wedding ceremony at this gorgeous setting nestled in the mountains. Wedding ceremonies are magicial just like the first dance at the reception. We had a nice breeze coming through, and the officant did an excellent job. I provided wireless surround sound. I noticed that some guests were trying to locate where the music was coming from because the speakers were basically invisible. This was a party of about 60 guests, and they partied like it was 1999. A big factor was that they all were in excellent condition. Runners, cyclists, hikers, soccer players, footballers, etc..., are great guests because they never get tired. Out of all the events during the wedding day the first dance is always the most majestic. The couple picks that very special song which signifies their love for one another. The song reveals a story into their lives as both individuals, and now a couple. We also get a glimpse into their personalities. The overall theme is a future lifetime of meaningful experiences shared together. Flawless outdoor ceremony. 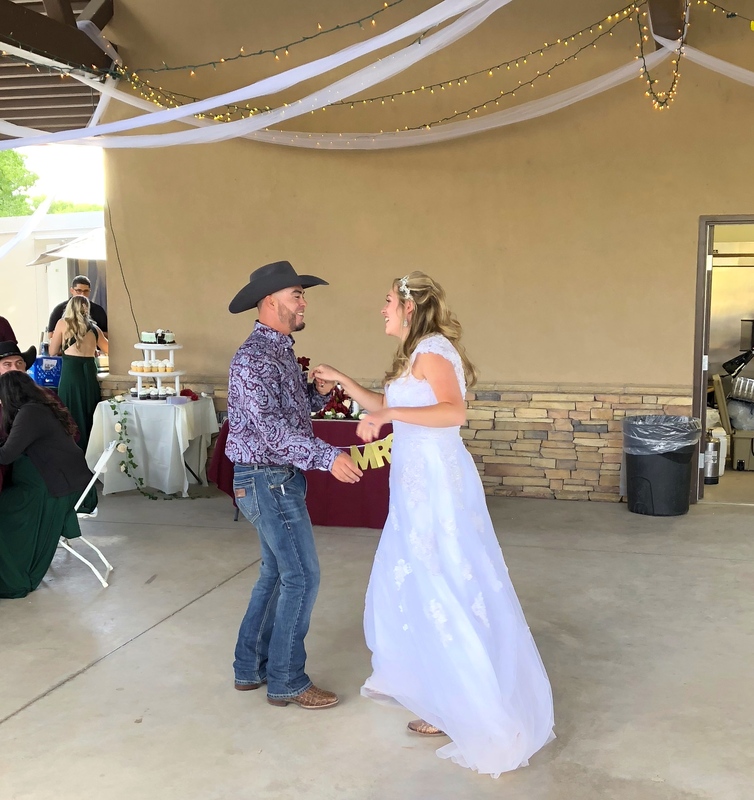 I noticed that the officiant was scared to wear a microphone because he had bad experiences in the past where novice DJs didn't do the microphone correctly. Mine worked perfectly for him. Ceremony work is a science and art, and if you get a novice DJ from a multi-op company doing your ceremony it can completely destroy the vibe. 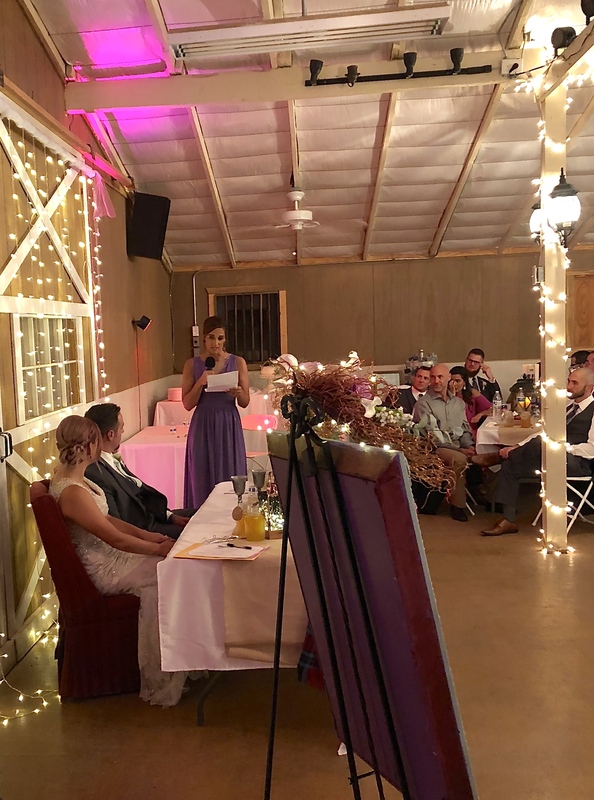 It took me years to perfect my ceremony system, and it's one of the things I'm most proud of. Check out the 16x16 white dance floor at this venue. These clients were amazing, and the guests were too much fun. Getting ready for the school season now. Mostly customized audio and visual systems for those events. Had a wonderful time doing this event for a United States Congressman, and his guests. They just wanted some nice music to enjoy. We weren't expecting any dancing at all; a dance floor was not even installed. But, who can resist a little George Strait at the right moment? Witnessed some great two stepping that night. 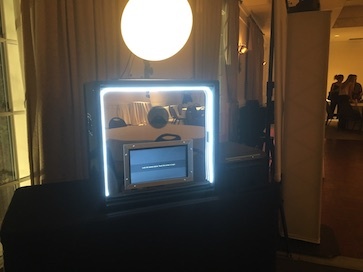 Now featuring our neon mirror photo booth. It will be a great addition to the option lineup. Contact me for more details. We had so much fun doing this event. These high schoolers were going haam. 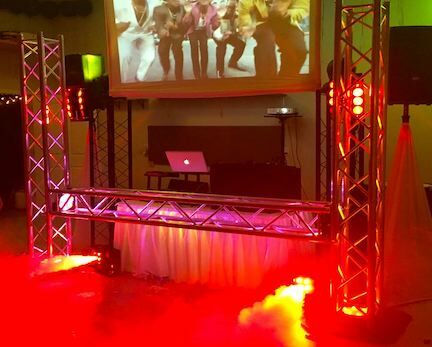 Fully customized system with dual subwoofers, dual fog fury machines, and video mixing. I can't believe we are toward the end of the forth quarter. Got some more new things for 2018; I see a mirror in your future (just a little hint). Only the very best to all of you for next year, and God bless! I've been wanting to do backdrops for years because they add so much elegance to an environment. As Red Sapphire has begun to grow I've been able to take on additional assistants to help with setup of larger events. Our backdrops are much more stable than the typical pipe-and-drape stuff out there. My system is solid as a rock. Contact me for more information on this new mid-year option. I just finished with school, and prom events for the second quarter of the year. I had a blast with these amazing young adults. I met so many that have so much on the ball. 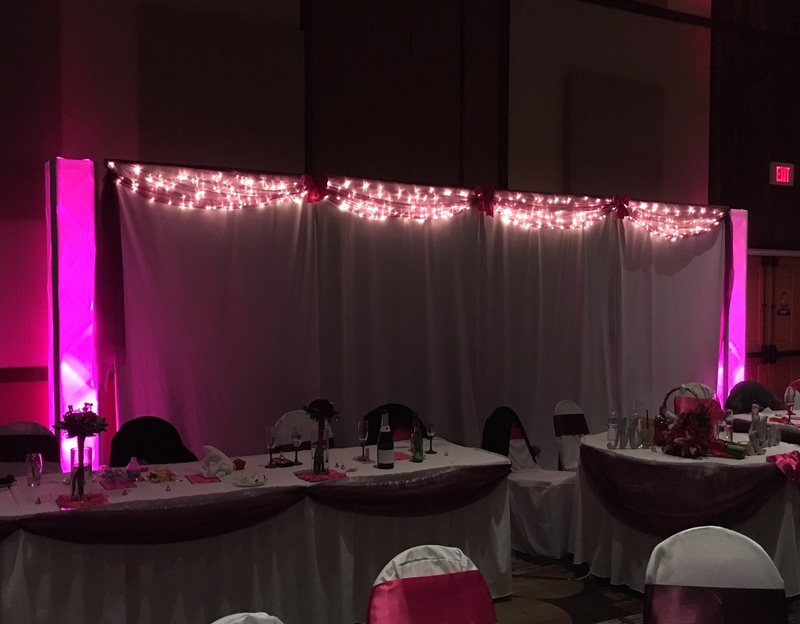 This customzied setup included some concert quality moving heads, and rear projection video mixing. I call this package "animal style." It's off the menu, but if you know the right guy you can order it. Thanks to all the amazing schools this year. DJing this amazing event in Algodones, NM. When the fraternities and sororities want their events done correctly they know who to go with.